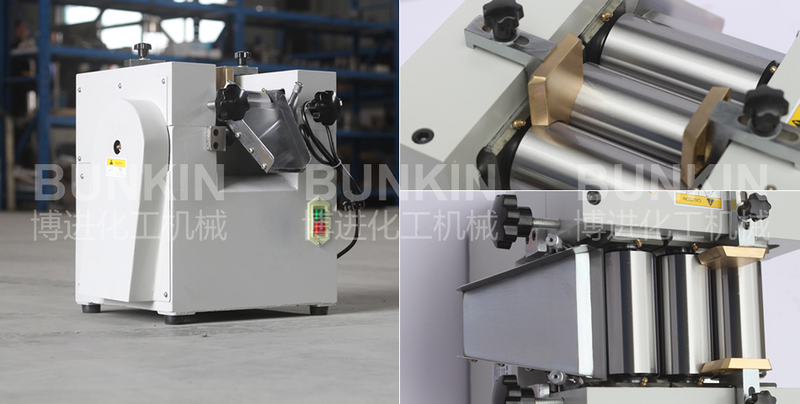 Lab Three Roll Mill_Anhui Bunkin Chemical Machinery Co.,LTD. Application Fields: Suitable for dispersing and grinding materials in industries such as ink, color paste, adhesive, biological, pharmacy, foodstuff, cosmetic, paint, photovoltaic material etc. Lab three roll mill is used for grinding and dispersing high viscosity and fineness material. 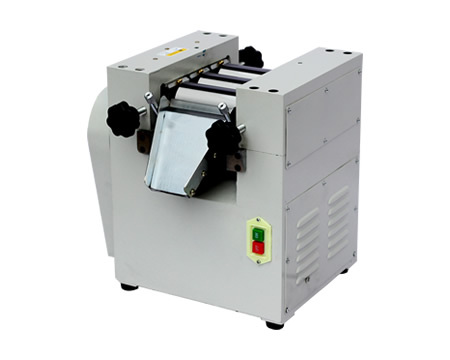 It is widely used in printing inks, pigment, plastics and chocolate's grinding test. The equipment consists of three rollers fixed on the frame and driven directly by the motor. The rotation direction between rollers is generally different, the former roller rotates forward, rear roller rotates backward. The speed of former roller is quick, while speed of rear is slow. The mid roller is fixed, former and rear roller are mounted on the slide with spring devise. Adjust the distance between three rollers by hand wheel. The material, charged from space between rear roller and middle roller, are squeezed by the rollers to obtain smaller particle size. Then the material are rolled out by the fast roll(Roll rotates at high speed).The scrapper at the fast roller separate materials from the roller and fall into the collection barrels.